Here is a ready-made PDF Force Field Analysis diagram which you can reuse for free. 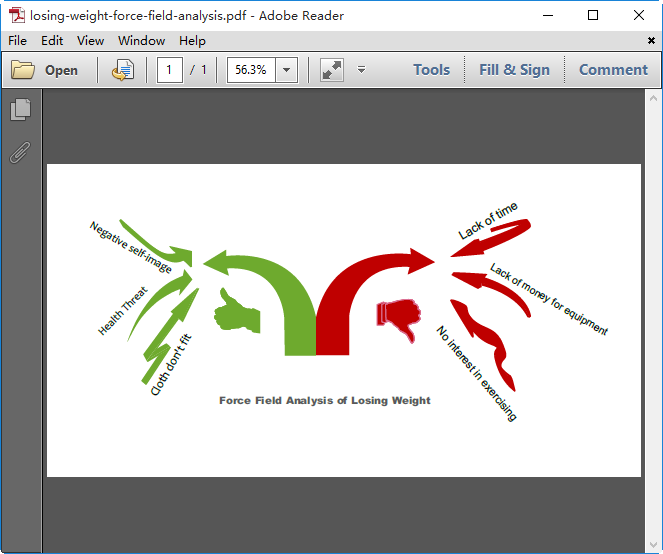 Creating a force field analysis diagram for PDF is not difficult with Edraw. It allows you to draw a force field analysis with built-in symbols and templates, and export to PDF in another 1 click. All templates provided can be customized. Colors, shapes, fonts are all editable. When the diagram is completed, one click and you will have it converted to PDF format with high clarity. Force Field Analysis Diagram can be used not only for daily life but also for business and public services. You can find them all in the Force Field Analysis Examples.